Welcome to Level 4 of the Idea Maker Course! This level is about you becoming at expert at your customer. Getting to know them better than they know themselves – the stuff of Steve Jobs myths and legend for sure, but just as much the secret sauce of that super innovative colleague or quietly successful repeat entrepreneur down the hall, across the incubator, or starting you down at that recent pitch challenge. It’s about getting out of the lab or out from behind your desk to test the hypotheses you have been building about your concept. And putting your assumptions to the test, including who your customers are really going to be and a bunch of assumptions you likely don’t even know you’re making. And, while it’s partly about putting your pitch to the test – for feedback, you’re going to find that it’s also about taking your pitch and your solution right out of the equation sometimes. So you can listen. And learn. And so you’ll be able to understand and then work backward from the right customer’s real experience. Imagine that your life depended on you making a success of your idea within 3 months. Like really really depended on it. You wouldn’t make a survey first. Or commission some marketing research. Or build a pretty pitch deck. Or do up a business model canvas. Or go for beers to run it by your friends. Or read an inspiring business book. Or watch a TED talk. 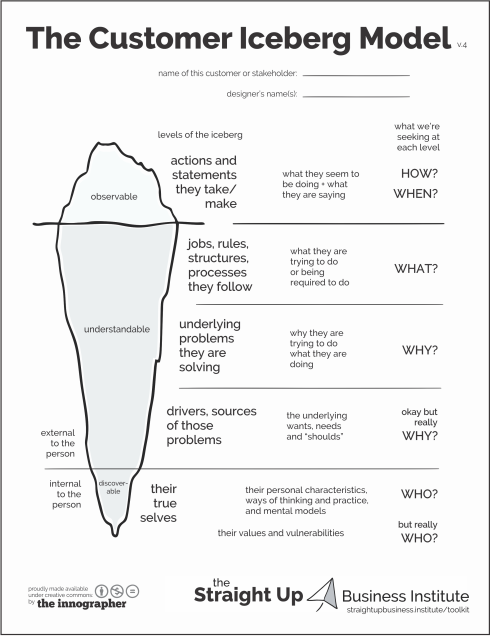 Most of the design-thinking or empathy style observations we might do up front aren’t too useful either. You can’t learn by observing if it turns out you’ve been observing the wrong person, for example. And simple observations aren’t often enough. Even if done with a little more sophistication, the situations implied here are often the result of not being able to get below the ‘what people say and do’ tip of the customer iceberg. Download it now and jump into the lessons below to get a deeper understanding and avoid committing some of the common fatal flaws. 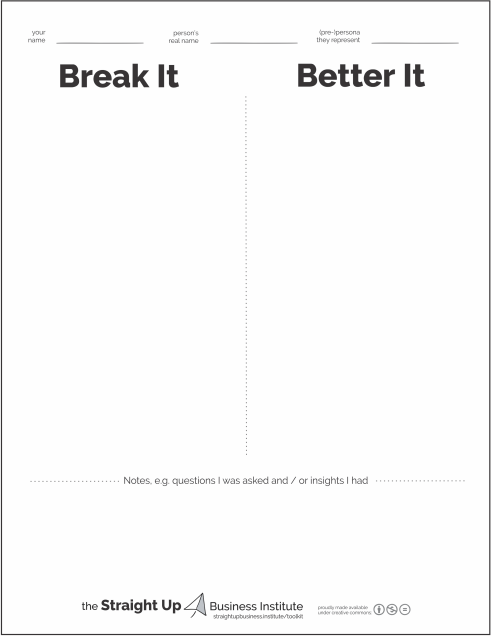 The ‘Break It and Better It’ form is one of our simplest tools. No doubt about it. And it’s true that we’ll often forgo the formal worksheet for columns drawn into our notebooks. But we find it to be incredibly powerful for getting us out of the lab, out from behind our desks, and away from the devices and screens we’ve been hiding behind. It’s the tool that consistently gets us out in front of the right people and consistently teaches us the most in those important early stages where we need to know if we have the right beneficiaries in mind and whether we’re actually going to be creating value for them. Take in the lessons below! Then click through the lessons below when you’re ready to break and then better your idea!